Reading on-screen can be tough on your eyes, especially if you have to do it all day long. We’re here to help. 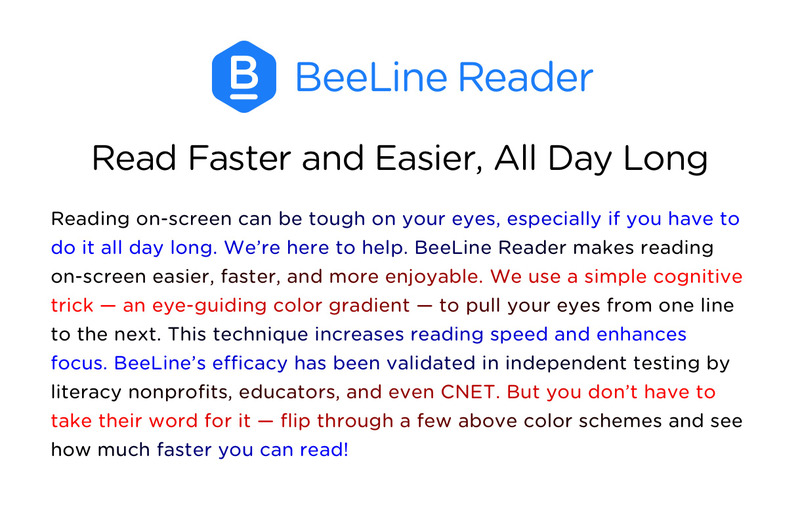 BeeLine Reader makes reading on-screen easier, faster, and more enjoyable. We use a simple cognitive trick — an eye-guiding color gradient — to pull your eyes from one line to the next. This technique increases reading speed and enhances focus. In addition to winning awards from Stanford University and the United Nations, BeeLine's approach has been validated in independent testing by literacy nonprofits, educators, and even CNET. But you don’t have to take their word for it — flip through a few above color schemes and see how much faster you can read! Try one of our apps, extensions, or converters and start reading in comfort! Our award-winning iOS app is featured in the App Store, and our Chrome extension has helped people read hundreds of millions of pages. You can also use BeeLine on Bookshare.org, Springwise.com, and in the ReadMe! apps for iOS and Android. Many companies are considering adding BeeLine to their products, and the more they hear from people like you, the sooner BeeLine will be available. Scroll through the icons below and click on a platform where you’d like to see BeeLine to show your support. It just takes a minute, but it makes all the difference in the world!